I almost forgot it’s Thursday, busy on my latest painting and completely lost track of time. Here is the pictorial of the drawing process for Sodus Point Lighthouse – graphite (9×12). Click onto the images for a larger view. Hope you have a wonderful weekend ~ thank you for checking in. 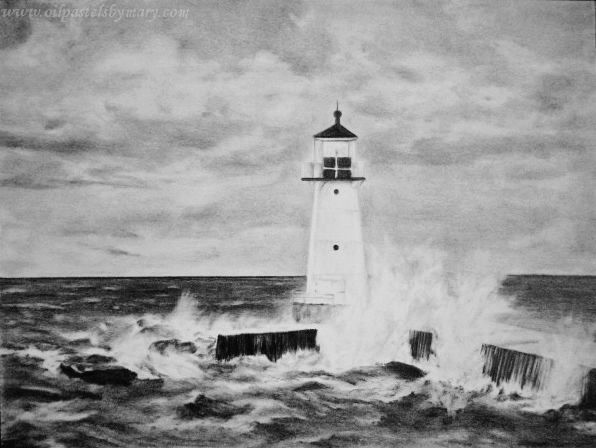 This entry was posted in Drawings, Thursday Drawings and tagged drawing, graphite, lighthouse, sodus point. Bookmark the permalink. This is a winner, Mary. Thanks very much Lulu! I’m currently drawing a scene along the Maine coast – pretty soon you’ll be up there. Hear that the interior Maine had upwards of three feet of soon – wow, did they ever get socked! The same is true for the coast. Close to 3 feet has fallen. Can’t wait to see your Maine drawing. Wow amazing, bet the coastline is gorgeous! Brilliant!!! I enjoy watching the progress of your drawings Mary. Thank you for sharing. Thank you Madhu, really appreciate it! I’m in the process of selecting my next Thursdays drawing – have several contenders. Wow, such power in those waves! Wonderful, Mary! Thanks Elena!! Hope you are well and looking forward to see your latest paintings. Wow absolutely incredible you can feel the movement of the water! Thanks so much Elizabeth, really appreciate it – was a great scene to work with! The graphite is a great medium for drawing rich, dark water. I love lighthouses. I can’t paint them but I can sure take photos! I can hear the crashing waves and gulls crying! Fantastic! Thank you for your great description Susan – I hear them too!! Very generous Heath, thank you – it was a great scene for a long drawing project. 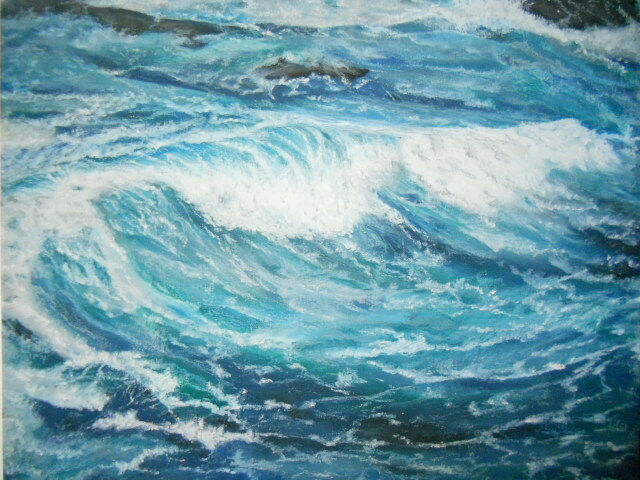 Developing the water shades is what brought turbulence alive – wild water I love to draw. How wonderful to see the progression right up until that glorious final version! Thank you so much Fiona. It’s great fun, but also a time for learning for me when I go back and study the development stages of a drawing. Finally, right Propsero? Like magic she appears! Thank you Angie really appreciate it! Have a wonderful week ahead. Thank you Jo – have a great week! Great post to show your process. I’m so glad you found my blog, Jean’s Writing. Thank you Jean, great to meet you – thank you for your nice feedback!! I just love this post! You are very talented, and it is a joy to visit here! Thank you my friend for taking the time to check the final out and for your generous comment, really appreciate it. Thank you Mark. I haven’t decided, although I’m leaning toward a charcoal lighthouse scene ~ stay tuned. Thank you Aquileana for your beautiful comment and wishes. Have a wonderful week ahead. Thank you so much Cha for your lovely comment and generous award – means a lot. I always enjoy seeing a series that shows progress. Interesting how late the lighthouse appears in the process. Well done, Mary! Thank you so much Frank – it’s a great process to get absorbed in. When drawing, rarely do I get anxious or nervous, or impatient about what steps to take or where the piece is taking me – there is something profoundly relaxing about drawing. Sometimes I’ll work on the main subject right off, but in this case I wanted to build the background and water, sort of letting the rest of the scene unfold as I worked allowing me to think about the lighthouse and how to develop it properly within the setting. Have a wonderful weekend. Patient and Prolific. You squeeze the most from each day! You know how to make my day Z! Glad to see you – hope your strength is building each day and your body is healing. Thank you for your beautiful compliment. Have a wonderful weekend, as you paint your way through life! Hi Maniparna, thank you so much – glad you enjoyed the process. Have a beautiful weekend. it’s a fine piece ! Thank you my friend, so happy to see you. Glad you enjoyed the drawing ~ capturing a scene like this is in pencil is something that I love doing. A quiet and sustained time of drawing allows me to totally connect to the subject – the most relaxing thing to do. Have a wonderful weekend. Fantastic outcome…and yes it’s lovely to see your process..
Ah, my favorite part…seeing them all together. Thank you Gallivanta – means a lot. Have a lovely weekend. Thank you Amy for your kind words – hope you have a wonderful weekend, finding that perfect scene through your lens. Doesn’t surprise me and seeing the results of your work is really extraordinary. I’m looking forward to seeing what you take this weekend. Magnificent, Mary! Thank you for sharing all of the stages. Wonderful job! Thank you Jill for your generous comment and for sticking with this long project. Have a great weekend. I wouldn’t have missed it! Happy Weekend! Watching the process day by day has been fascinating and the end result is delightful, Mary. Thanks Sarah! I really like the building process of a drawing, especially with water – to see it come alive with pencil is a very cool thing. Thank you – hope you have a wonderful and creative weekend. It is really interesting to see the different stages of your drawing. Congrats on finishing it and remembering to take pictures of the different stages. (I have a hard time remembering to do this.) Have a wonderful weekend! Hi Janell – thank you so much! When I first started to paint I began taking photographs of each stage in every piece of art I created whether paintings or drawings – so I could see how they progressed, but also as a documentation of my work. A habit that stuck with me and now the best part, when someone takes an image of mine or lays claim to one of my pieces – they don’t have a chance, my documentation takes care of the issue. Thanks Holly, have a wonderful and creative weekend.